This was to be our second visit to the Karoonda Farm Fair. Last year’s event provided us with the opportunity to experience a real country town show and this year was even better. 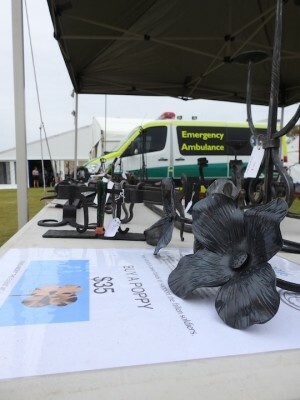 The local organisers put on a professional two-day function, with a full range of attractions to please everyone who attended. This year delivered fine weather and good crowds. 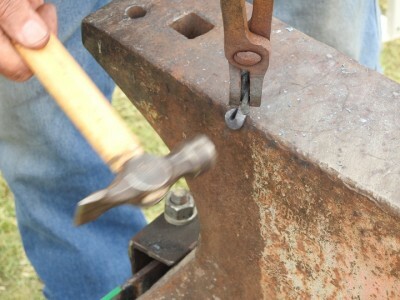 Our ABASA group field-tested a portable forge this year, courtesy of our own Geoffrey Barnes. 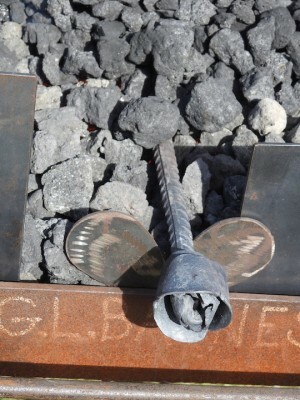 The forge performed well and provided a perfect low running fire for the small projects we forged over the two days. This little electric blown forge set up has the capacity to spool up to fire welding temperature pretty smartly if required. John Fergus provided a pair of side wings with our name emblazoned on the sides. They made a huge difference to the running and upkeep of the fire. Kirstie and Chris at work. Our crew this year included Chris and Bev Carter, Kirstie Stewart and myself. On the Saturday, we had Terry Johnson, Anthony and Regina Helbig. Chris finishing off a commissioned pendant. 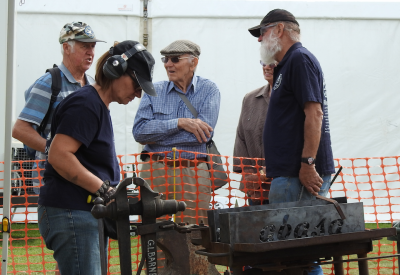 There was a lot of interest shown on the trading table and forging demonstrations, although the sales of items were down this year compared to last year. I’m pleased to say the poppies I forged disappeared pretty quick, so I have another few ready for Kapunda next weekend. Part proceeds of the poppy sales go to the Ypres Event in Belgium. 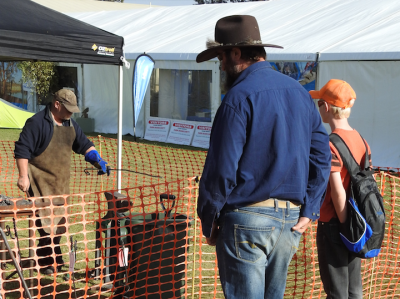 Karoonda Farm Fair is the perfect stepping off point to the busy schedule of events in front of us for the year. Being a couple of hours from town, it’s not too far to visit, even for the day. Mark it on your calendar for next year and bring your tools. Thanks to all for being part of the show.